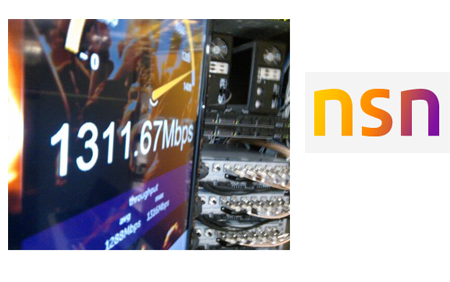 Sprint demonstrated 1 Gigabit per second (Gbps) over-the-air speeds at its lab near Silicon Valley, California. 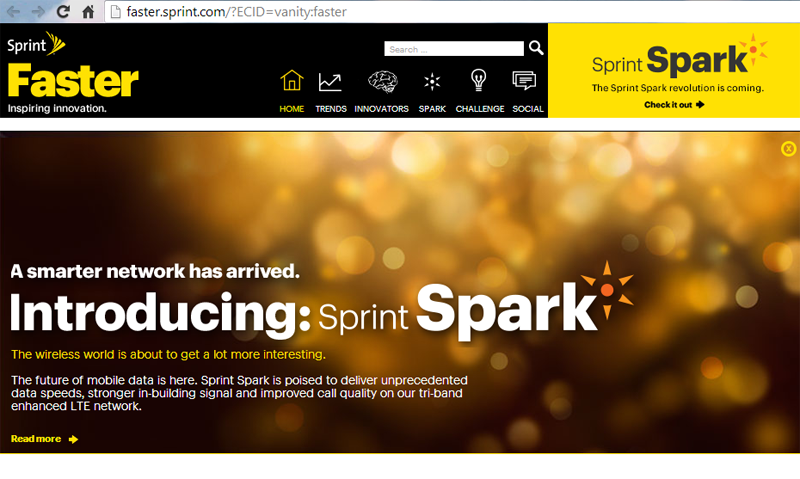 Sprint Spark, which is still in prototype status, uses carrier aggregation to combine FDD-LTE at 800 MHz and 1.9 GHz with TDD-LTE at 2.5GHz. Sprint claims that it is technically feasible to deliver more than 2 Gbps per sector of over-the-air speed given its extensive spectrum licenses, especially in the 2.5 GHz band. high-speed capability demonstrates 50-60 Megabits per second (Mbps) peak speeds today with increasing speed potential over time. Given Sprint's spectrum and technology assets, it is technically feasible to deliver more than 2Gbps per sector of over-the-air speed. "Sprint Spark is a combination of advanced capabilities, like 1x, 2x and 3x carrier aggregation for speed, 8T8R for coverage, MIMO for capacity, TDD for spectral efficiency, together with the most advanced devices offering both tri-band capability and high-definition voice for the best possible customer experience," said Dan Hesse, CEO of Sprint. Sprint announced plans to deploy Spark in about 100 of America's largest cities during the next three years, with initial availability in five markets today at lower speeds in the 50-60 Mbps range. Sprint 4G LTE service will be available by mid-2014 to approximately 250 million Americans, and Sprint expects 100 million Americans will have Sprint Spark or 2.5GHz coverage by the end of 2014. The first markets with limited availability are New York, Los Angeles, Chicago, Tampa and Miami. The first smartphones with Sprint Spark capability are scheduled for customer availability in early November. Sprint current has approximately 55,000 macro cell sites and plans to stay at this level for the next few years. A rollout of small cells beginning next year will augment capacity, coverage and speed. Alcatel-Lucent, Nokia Solutions and Networks and Samsung have been selected to provide 2.5GHz radio heads and to enable Sprint Spark. Each company will service approximately one-third of Sprint's deployment markets. The 2.5GHz radios are expected to have capabilities for 8 Transmitters 8 Receivers (8T8R), which will be a first deployment of its kind in North America. These radios will be capable of improved coverage, capacity and speeds when compared to the more traditional 2T2R or 4T4R radios used by our competitors. Sprint Spark is designed to accommodate all of Sprint's spectrum bands on a single tri-band smartphone. The first tri-band devices will be available to customers in the next few weeks and offered by HTC, LG and Samsung. Sprint's HD Voice capability, which is also supported on 3G, reaches approximately 85 million people across the Sprint network today, and the company expects 250 million to have access to HD Voice capability by mid-2014. Sprint expects 12 million HD Voice devices in the customer base by the end of 2013, growing to 20 million by the end of 2014. Nokia Solutions and Networks confirmed a new contract with Sprint for the deployment of TDD LTE in 2.5 GHz spectrum across the United States. Financial terms were not disclosed. Under the contract, NSN will implement its TDD LTE Radio solution with the latest LTE-Advanced-ready software capabilities and NetAct network management system. NSN will also provide professional services. NSN’s TDD LTE Radio solution features the company’s Flexi Multiradio 10 Base Station using high capacity baseband platform and high bandwidth TDD LTE 8-pipe radio. NSN noted a top downlink thoughput of 1.3 Gbps using its Flexi Multiradio 10 Base Station at the demonstration of Sprint Spark at the Sprint facility in Burlingame, California. "As we enhance our network, we need not only a return on our invested capital, but also a partner with proven TDD LTE leadership, innovation and commercialization expertise,” said Bob Azzi, senior vice president of Network Operations for Sprint. “NSN is an ideal vendor for our deployment, which will provide our customers with increased speeds and capacity in densely populated cities. We are excited to showcase what the future might hold through a live demonstration of TDD LTE Advanced with NSN’s commercial base station." Internap Network Services agreed to acquire hosting and cloud provider iWeb for approximately $145 million. Montreal-based iWeb provides on-demand server and cloud infrastructure to over 10,000 customers. The combination creates a top five pure-play IT infrastructure services provider, with trailing twelve months revenue in excess of $320 million. Headquartered in Montreal, Canada, iWeb serves 10,000 SMB customers in more than 100 countries and has approximately 200 employees. Internap said iWeb’s dedicated and cloud hosting offerings complement its own portfolio of bare-metal and virtual cloud, managed hosting and colocation services while significantly expanding its addressable market to SMBs. "iWeb fits perfectly into our strategy to deliver a comprehensive portfolio that can serve the needs of our customers at every stage of their business lifecycle, from an initial start-up wanting a single dedicated server to a scale-out Internet app provider or global enterprise requiring a hybrid solution across multiple data centers around the world,” said Eric Cooney, president and chief executive officer of Internap. "This combination represents a milestone in the transformation of Internap’s business to a leading IT infrastructure services provider that can deliver on customers’ complete range of IaaS demands." CableLabs announced the availability of its DOCSIS 3.1 PHY (physical layer) and MULPI (MAC and Upper Layer Protocol) specifications. Speed: Defines support for up to 10 Gbps downstream and up to 1 Gbps upstream network capabilities. Higher Capacity: Enables a significant increase in network capacity with the ability to transmit up to 50 percent more data over the same spectrum, on existing HFC networks. 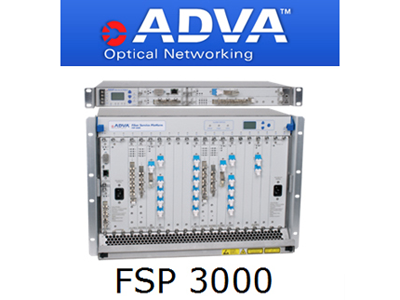 DB Systel GmbH has selected the ADVA Optical Networking's FSP 3000 platform to support metro and long distance network applications. AXIANS is named as systems integrator. DB Systel, which is a subsidiary of Deutsche Bah and based in Frankfurt, is one of the leading providers of ICT services in Germany. As DB Group’s internal ICT provider, DB Systel provides data center services, connection of ticketing machines, online bookings, sales and passenger information systems, schedule control, video surveillance and internal office communications. 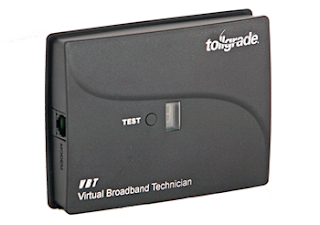 Tollgrade Communications introduced a "Virtual Broadband Technician" (VBT) customer premise device for diagnosing slow broadband connections. The device can be used to pinpoint problems like intermittent faults, noise on the line and unresolved line speed instability. The VBT is placed in line with the residential DSL modem. It then performs a series of 50 tests, and can diagnose the cause of the problem – whether it lies within the customer premises (e.g., electromagnetic interference in the home) or anywhere in the local access network. Tollgrade said its data from VBT field deployments found that 82 percent of tested customer premises equipment (CPE) would have been returned unnecessarily had it not been for the diagnostic capability of the VBT. By correctly pinpointing problems inside the home that would otherwise have been left undiagnosed, the VBT reduced repeat dispatches by over 50 percent, saving millions and reducing customer churn. JDSU reported revenue of $429.0 million for its fiscal 2014 first quarter ended September 28, 2013, with net income of $0.3 million, or $0.00 per share. Prior quarter net revenue was $421.3 million, with net income of $92.5 million, or $0.38 per share. Net revenue for fiscal 2013 first quarter was $420.9 million, with net loss of $(11.6) million, or $(0.05) per share. “We are pleased to have delivered our 28th consecutive quarter of positive operating cash flow, further strengthening our balance sheet and ability to fuel JDSU’s strong innovation pipeline,” said Tom Waechter, JDSU’s President and CEO. “Our results for the quarter were driven by strong growth in products that help our customers build out network capacity and this, coupled with robust customer adoption of our new products, positions JDSU well in the markets we serve." Americas, EMEA and Asia-Pacific customers represented 46.4%, 24.3% and 29.3%, respectively, of total net revenue for the quarter. The company held $1,087.3 million in total cash and investments and generated $29.5 million of cash from operations for the quarter. Aviat Networks has hired Ola Gustafsson as senior vice president, product and services portfolio management. He most recently served as Ericsson's head of product line microwave and mobile backhaul. ARRIS reported Q3 revenue of $1,067.8 million and GAAP net income in the third quarter 2013 was $0.13 per diluted share. The company ended the third quarter 2013 with $695.0 million of cash resources. "I am very pleased with our third quarter results and our outlook for the balance of the year. Our customers continue to react positively to our Motorola Home acquisition and we are making good progress in delivering new products to our customers," said Bob Stanzione, ARRIS Chairman and CEO.